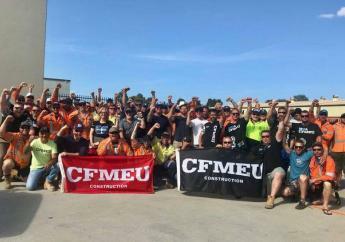 NSW construction workers at Boom Logistics and Wollongong Crane Group (WCG) have won their first pay rises in five years. The companies had not made any realistic offer despite months of negotiations. WCG then tried to place its workers on different awards with different expiry dates, to divide them. “‘Our members are just asking for a fair pay increase at a time when wage growth is at record lows and company profits at record highs,’ Mr Greenfield said. The workers wanted a standard EBA and voted to take protected action. WCG then challenged this in the un-Fair Work Commission alleging it breached pattern bargaining rules. Instead of ruling, the Commission cancelled protection. This was meant to tie workers’ hands. Immediately, Boom lodged the same action with the Commission as WCG. The union successfully challenged, this time increasing the claim to far above the union standard. It effectively knocked the pattern bargaining allegation on its head. That win by the CFMEU was expensive. Top barristers don’t come cheap. But solidarity was the key. Next five picket lines were set up against WCG in Unanderra and Smeaton Grange and against Boom in Warrawong, Newcastle and Singleton. Unanderra and Warrawong are in the Illawarra, south of Wollongong, while Smeaton Grange is near once rural Camden, around 80 minutes from the Sydney CBD and around an hour from Warrawong. Like Newcastle, Singleton (an hour’s drive away) is in the Hunter Valley, a centre of both coal mining and wine growing. They are three and a half hours from the other picket lines south of Sydney. Juggling the five picket lines was made easier by the strong industrial history of the Illawarra and Hunter. The Illawarra currently has the most independent and determined Labor Council in NSW. Pity a corporation which takes on a battle in these regions, even one owned by US multi-billionaire Warren Buffet. His company, Freo Cranes, bought out WCG during EBA negotiations. We didn’t sign up for this! 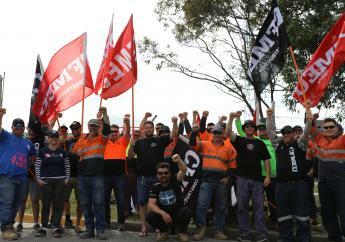 “Community support was great,” says a member of CFMEU NSW Committee of Management. “We also had a lot of support from delegates and activists from the union. “After two weeks WCG caved in and signed a union standard EBA, with permanent employment and up to 20 per cent wage rise. “Boom held out for five weeks then signed on Thursday, November 13, with increases across the three depots of between 24 and 40 per cent. “Bosses who’ve given themselves 20 per cent or more bonuses and are now complaining the strike cost them business worth $3 million,” he said. During the strike, no cranes left any yard, but before the disputes, the companies had hidden cranes in lay-bys or back streets. Locations were found, cranes followed or stopped from working. Scabs flown in from WA by WCG, saw their photos on social media. “We didn’t sign up for this!” they told management before heading home. Levies were placed on building sites across NSW to stop the bosses starving out the workers. “Similar tactics were regularly used in the past and are the most effective when combatting the bosses,” Vanguard was told. Other crane yards were watching the blue intently. The victory shows, that with strong union leadership and unwavering resolve from workers, important victories can be won. They are training grounds for a much bigger and fundamentally different fight. It won’t be for a bigger piece of the capitalist pie that unions fight for. It will be for the whole cake.